Lots of folks were seen out at Makapuu on Thanksgiving Day: Jetflap, Bob, Ray, Don, One Eye, Ken B, Reaper, Carl from AK, Juan from Medellin, Hilo Ken, Scrappy, Dave, Doug, Peter, Sandy, Greg and me. The morning shift launched from Cactus, flew the ridge, and then left to start their feasts. The afternoon shift showed up later with plans to head downrange, despite the low cloudbase. 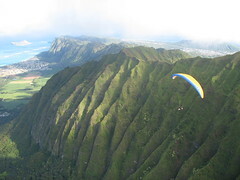 Doug and Peter skimmed the clouds to Haiku Valley and back, leaving Dave behind at Kaneohe District Park. Me and Scrappy followed but stopped at Green Walls, playing around there in the low cloudbase and waiting for the other guys to return. What a fun day - let's do it again soon. I'm very thankful for all my great friends and for days like this when I can share the sky with you.